"I'm not the devil...I'm something much, much worse." Death is inevitable. It will eventually claim us all (unless science intervenes). When the life is claimed is the subject of debate, but hopefully it's not claimed too early--something that's punishable in Death One-Shot #1 from Zenescope. The issue is written by Ralph Tedesco, illustrated by Gregbo Watson, colored by Fran Gamboa and J.C. Ruiz and lettered by Fabio Amelia. For a year now, Keres brought terror to humanity and killed many before their allotted time. Now, the goddess of death must stand trial for her indiscretions. The premise behind Death One-Shot #1 is pretty intriguing. As one of the bringers or death, Keres has been a little reckless with her abilities, choosing to claim lives where she deems fit. 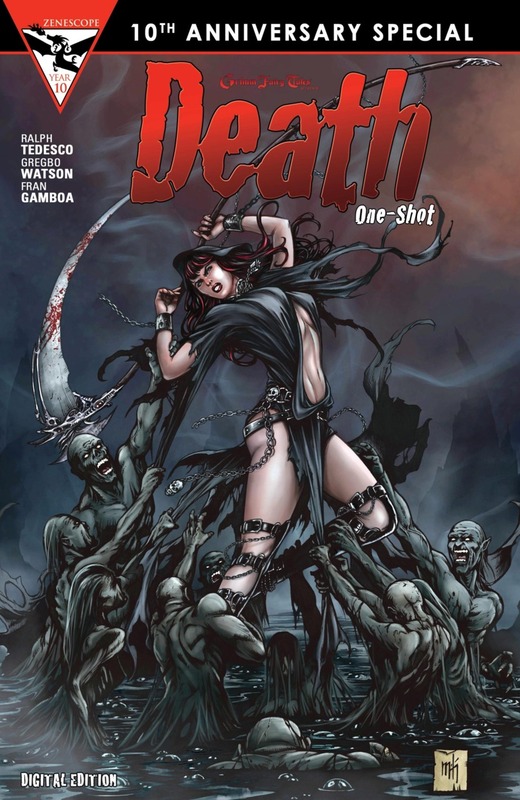 In this sense, Tedesco uses Death One-Shot #1 as a means of offering her atonement, even if it's not by her own choice. Tedesco's dialogue goes a long way in achieving this as well, offering Keres as a character who starts off as cocky and ends up relatively contrite. The issue taps into something of a "this is your life" format, where Keres is forced to come to terms with the extreme consequences of her decisions and abilities. Death One-Shot #1 moves between life and the afterlife, with Watson illustrating both fairly effectively. He does a good job rendering many of the key figures in death in the Grimm Fairy Tales universe, including the Grim Reaper, Abaddon, Thanatos, Ankou and Pesta, with all of them boasting a unique appearance. Keres is illustrated moving back and forth between worlds, yet Watson renders her in a way where you would easily believe she was a human. There are some particularly gruesome scenes peppered throughout the issue that Watson uses to strong effect, emphasizing the extent of Keres' punishment. And the colors by Gamboa and Ruiz give the book some variety in the scenarios Keres is put through, as well as offering an ethereal nature to the gathering of the death bringers. 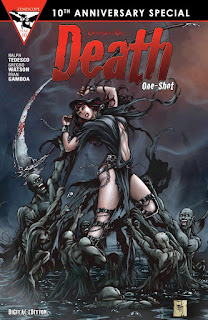 Death One-Shot #1 definitely fits within the Grimm Fairy Tales universe and the events within will likely play a role in shaping the universe down the road. Keres is forced to face the consequences of her wonton decision-making, yet it seems that by the end she at least has a better understanding of the responsibilities that come with her power. Tedesco's script is pretty fast-moving and works really to get the reader from point A to point B. Watson's illustrations are clean and give the reader enough to know what's going on. Death One-Shot #1 is an interesting one-shot that offers growth to a character who plays a fairly sizable role in her universe. Death One-Shot #1 is in stores September 23.